September is National Emergency Preparedness Month. While developing an emergency preparedness plan may not seem like a priority, Hurricane Katrina in 2005, the 2011 tornado in Joplin, MO, and Hurricane Sandy in 2012 among other natural disasters serve as examples of the value of emergency preparedness. The recent floods in Baton Rouge, LA provide a close to home reminder of the enormous toll that a natural disaster can take on an entire community. Our colleagues at the Louisiana Program report that the program was heavily impacted. Normal state/grant operations were curtailed in order to focus attention on response and recovery efforts including staffing shelters. Families and staff have been displaced and many have lost their homes and belongings. National Emergency Preparedness month is a natural opportunity for federal home visiting recipients to review their communications with state emergency management agencies. They can also ask LIAs about their preparedness, response, and recovery policies and plans to coordinate with local authorities. In addition, home visitors can help families prepare for emergencies including natural disasters such as hurricanes, tornadoes, wildfires, and earthquakes, and for unpredictable disruptive events that may occur in their communities. While these emergencies can affect an entire community, other incidents such as home fires can cause death and injury as well. Emergency preparedness experts, including the Federal Emergency Management Agency (FEMA), the Centers for Disease Control and Prevention (CDC), and the American Academy of Pediatrics (AAP) remind us that planning ahead can help mitigate stress when disaster strikes. What can home visiting recipients do? Home visiting recipients should share critical information with LIAs about state-level disaster planning efforts including their state’s emergency procedures, policies on declaring disasters, emergency operations centers, and incident command structure. “Lead Agencies should consider ways to make formal connections with and actively engage representatives from emergency management agencies and key partners. Fostering connections at the county or local levels can facilitate collaboration during an actual disaster by establishing ‘on the ground’ relationships and contacts ahead of time. What can LIAs do at the local level? LIAs should be engaged in disaster planning in their communities. Local emergency management offices and ACF Regional Emergency Management Specialists can share recommendations for planning, preparing, responding, and recovering. Many communities have Community Response Teams, Children and Youth Task Force in Disasters and/or Disaster Behavioral Health Coalitions. Engage in collaborative planning with other organizations in the community. These organizations include emergency management and emergency personnel agencies, public health agencies, and other volunteer agencies. Plan for continuity of operations in case of an emergency. Establish a communication plan for how to maintain contact with all employees as well as plans to protect vital records including insurance policies, rental agreements, building plans, bank account records, service agreements, and other documents needed to operate the organization. Develop an information technology plan to back up and retrieve critical data. Develop policies that support staff needs to deal with their own family emergencies even as they are involved in response efforts. Recognize that staff may be dealing with their own and their family’s needs, including damage to or the possible loss of their homes and belongings. The Centers for Disease Control and Prevention provide tips for first responders that may be helpful to share with home visitors and support staff impacted by a large scale community disaster. How can home visitors support families in preparing for emergencies? Make a plan. The pamphlet Taking Care of Our Family: Preparing for Emergencies and Disasters, developed by the Administration for Children and Families Office of Human Services Emergency Preparedness & Response, provides a format for recording emergency contact information. It lists important documents to copy, and what to include in emergency kits. https://go.edc.org/d7ef. Prepare for the natural disasters most likely to occur in their community. 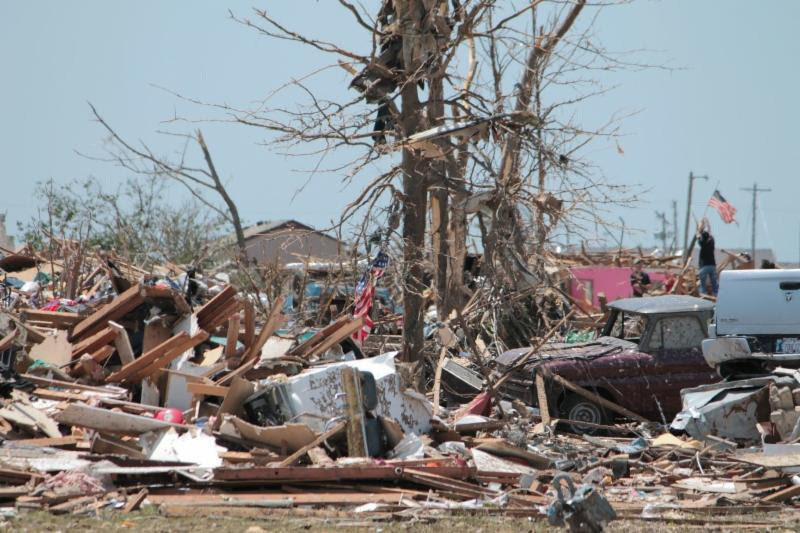 Coastal areas face hurricane season from June through November while tornadoes can occur at any time of year and in any state although they are most common in the Central Plains and southeastern states. Some emergencies, such as hurricanes, allow families to have some time to prepare while others such as earthquakes may not allow time for families to gather even basic necessities. Different types of disasters require different safe spots in a home. According to the CDC’s resource Emergency Preparedness and You, during an earthquake the best thing to do is to drop, cover, and hold on under a sturdy desk or table. However, during a tornado, it is important to seek shelter in a lower level room without windows. https://go.edc.org/xpyc. Know where to get up to date emergency information. This Infographicfrom the National Oceanographic and Atmospheric Administration (NOAA) shows the six ways to get warnings about an emergency event. Families should have a battery powered or solar radio available in case of a power outage and follow any local evacuation instructions. Consider how they will communicate and find each other in an emergency. Compile a list of emergency contact numbers, including police, fire department, poison control, and a local hospital as well as family and friends. Give each family member including older children a contact card. Remember that local phones and social media may be flooded by the sheer number of people trying to use them. The CDC recommends texting as the best option and suggests that families make sure that all family members other than young children know how to text. Families should also have a plan for where they will meet if they get separated. In fact, the CDC recommends three meeting locations – one in the neighborhood, one just outside the neighborhood, and the third out of town. https://go.edc.org/8n88. Gather an emergency supply kit. In addition to the list included in the ACF pamphlet described above, the CDC (https://go.edc.org/wu70), the AAP (https://go.edc.org/9nc2) and FEMA (https://go.edc.org/4ttt) have comprehensive lists of emergency supplies. Essential supplies include a three-day supply of water, nonperishable food, and a manual can opener, as well as medications and a list of prescriptions, cash, maps of the area, a cell phone charger, extra batteries and a toothbrush. Copies of important documents such as birth certificates, social security cards, health records and health insurance information should be stored with the to-go kit. If there is advance notice of an emergency, it’s good to have a full tank of gas. Keep older children in the loop. Involve them in putting together your emergency supply kit. Even preschool children can be taught how to dial 911. Have them memorize at least one emergency contact number. Share age-appropriate resources such as FEMA’s Ready.gov for Kids/Family Communication Plan (https://go.edc.org/ub01). Sesame Workshop has a Let’s Get Ready Toolkit that includes YouTube videos stressing simple but important things for young children such as learning their first and last names. https://go.edc.org/xekg.